I think I’m becoming what you might call a “webpie”. That is, like a magpie I’m attracted to shiny things, shiny things on the web that is. 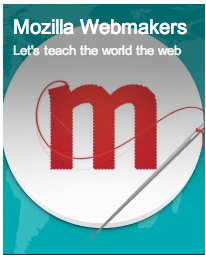 This week I’ve been dazzled by the “Teach the Web” MOOC being offered by Mozilla. Although I’d been aware of the open course for some while, I hadn’t actually thought of participating in it. I was looking forward to easing off from my recent online learning bonanza, but something about it caught my eye and drew me in. So shiny, “Teach the Web”. Week 1, entitled “Making as Learning” is a topic with which my curiosity had already been piqued. A tweet, by Mary Loftus at the PELeCON conference, had firmly lodged it in my head. Relating to maker culture, it made the point that individuals who can demonstrate their skills will have an advantage over those who rely on qualifications. I’m familiar with the idea of literacy and the ability to write the web through coding, but I’m largely unfamiliar with the wider “Maker Movement”. Without doubt, the blurb in the introduction to the course was highly appealing. meant to be a social collaboration, rather than a solo deep dive into content. Q: Sound doable? A: Yeah, I suppose I just about have 2hrs. It sounds like fun. I also joined the “writing as making/making as writing” study group, which, within the many facets and interpretations of web and digital literacies, is probably closer to my “making” proclivities. The reading and reflection for the week offered a nice sample of readings and resources to start us off thinking about “making as learning”. We are all makers in some form. In the act of making we express ourselves through our creations, and in the process we reflect, share and learn. The “Maker Movement”, as Rufi Santo’s article explains, takes its core ideas from Constructionist learning theory and the foundational work of Seymor Papert to espouse that “making”, when it’s done in and is contingent upon well configured social contexts, such as communities of practice and affinity spaces, as opposed to more solitary expressions, offers exciting possibilities for learning in this day and age.